Make a vegetable stock using onions, leeks, garlic and parsley. Wash the mushrooms and cut them into small pieces. Soften the shallots in the oil, then add the mushrooms. Cook briefly, add the wine and reduce. Set aside and keep warm. In a heavy bottomed saucepan toast the rice with olive oil and then add the stock, a ladleful at a time, until the rice is cooked. When the rice is cooked 'al dente', add the mushrooms and the truffle juice. Remove from the heat and stir in the butter. Rest the dish for a couple of minutes before serving. If you don't like goats cheese, you can use Parmigiano Reggiano, Taleggio or Crescenza cheese. Serve with a cheese platter and vegetable side-dishes or salad. Pinot grigio, Chardonnay, Cabernet, Syrah or Barolo. Risotto is a special dish, one that always gives you that Sunday feeling, no matter what its ingredients are. There are two main reasons for this: first of all its rich taste; and secondly it is a dish that requires care, love and patience. 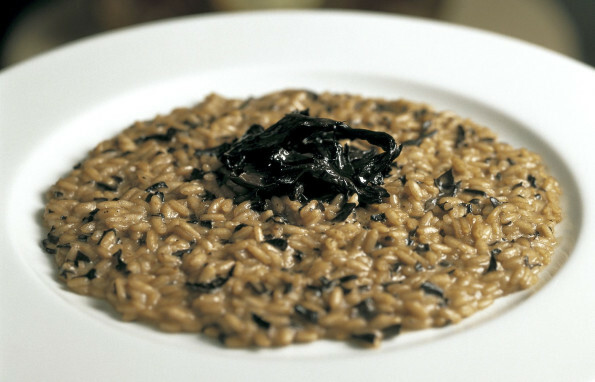 This time we want to suggest to you a typical autumnal risotto recipe, featuring wild mushrooms, goats cheese and truffle.